Home » Unlock More Sales Potential with the New Kasp 125 Keyed Alike Counter Display! Unlock More Sales Potential with Kasp 125 Keyed Alike Counter Display! Kasp, the leading brand in security from Carl Kammerling, just launched its new Kasp 125 Keyed Alike Counter Display. Carl Kammerling is constantly looking for new ways to help its customers maximise sales and the new Kasp 125 Keyed Alike Counter Display provides the perfect way to promote the availability of a keyed alike solution in-store, as well as a quick and easy counter purchase for consumers looking to simplify their security. This smart, compact counter display has been designed to create maximum impact at point of sale and contains 6 different sizes of Kasp 125 Keyed Alike padlocks, in two different security levels. 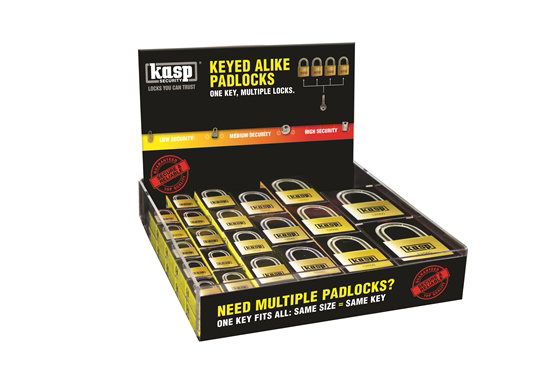 The Kasp 125 Keyed Alike Counter Display includes a range of premium brass padlocks, all featuring a hardened steel shackle and double bolted locking mechanism, ensuring exceptional strength and reliability. The counter display itself comprises a compact unit, with an acrylic tray, plus an eye-catching and informative gloss header and front sticker, to help consumers who would benefit from the convenience of a ‘one key fits all padlock solution’ select the keyed alike padlocks best suited to their needs. Kasp consumer-friendly packaging also plays an important part in influencing purchasing decisions. The two different colour coded security levels on offer (low and medium) are clearly highlighted, together with helpful stand-out graphics illustrating each lock’s usage. The Kasp Keyed Alike Counter Display is available as a single purchase item (£446) and is also offered at a very attractive promotional price – call us now for more details.